Women of the Wall. Right to equal prayer? End to religious wars at Jerusalem holy site? Jewish Agency Chairman Natan Sharansky has drafted an outline for equality between men and women and between Orthodox, Reform and Conservative Jews at the Western Wall plaza. Sharansky will submit his recommendations in the coming days to Prime Minister Benjamin Netanyahu, who asked him to find a solution to the issue. The suggested solution, which is being exposed by Ynet for the first time, has received the consent of all parties – from the ultra-Orthodox public in Jerusalem to the Reform Jewry in the United States. It calls for the creation of continuity from the Western Wall plaza in the north to the Robinson's Arch site in the south, and a division of the territory, which is some hundreds of meters long, into three equal parts: For men, women and a mixed public. Sharansky, who is visiting the United States these days, presented the outline to Reform and Conservative Jewish American leaders, who he says gave their consent in principle to the proposed solution. The Jewish leadership was approached after tensions between the State of Israel and the Diaspora Jewry over the Western Wall issue reached a climax in recent months, threatening to undermine Diaspora Jews' support for Israel. Before leaving for the US, Sharansky briefed Rabbi of the Western Wall and the Holy Sites of Israel Shmuel Rabinowitz, who is seen by many as the person responsible for the radicalization and "haredification" of the holy site. Rabinowitz offered his support for the move as well. The Jewish Agency chairman said that the parties still had slight reservations, but that the disagreements were now insignificant and could be bridged. The Robinson's Arch site, also known as the "Southern Wall," is located south of the Western Wall plaza, and is the place where a High Court ruling has permitted every person to pray according to his or her own faith, including the Women of the Wall organization. At the moment, however, the site is completely separated from the Western Wall and is significantly smaller and only open for special occasions and for several hours a week. For this reason, the Women of the Wall insist on praying according to their faith – wearing a prayer shawl, reading the Torah and reciting the Kaddish prayer – at the main plaza, despite repeated clashes with the police. If the Sharansky recommendations are implemented, the alternative site would be significantly expanded and used for prayers, events and mass ceremonies. In addition, it will be open at all times, will be connected to the Western Wall plaza by creating continuity, and there will be one entrance to all parts of the new compound. As far as the Women of the Wall are concerned, this means that they will be able to continue praying the way they are currently permitted to do at the women's section, while the customs which are currently banned there (or the entire prayer if they wish) will take place at the part added to the Western Wall. Yet sources who were involved in the drafting of the recommendations estimate that the group members will not accept the solution, seeing themselves as still excluded from the main plaza. However, they will likely lose the support of the world's Reform and Conservative Jewry and will be perceived as a marginal, radical element which cannot be satisfied. On the other side too, extreme haredi groups are expected not to accept the reorganization of the Western Wall and protest on different occasions against prayers and events which they do not approve of. The sources noted, however, that the opposition on both ends will not be enough to sabotage the move, which will be accepted by the majority of the Jewish people. 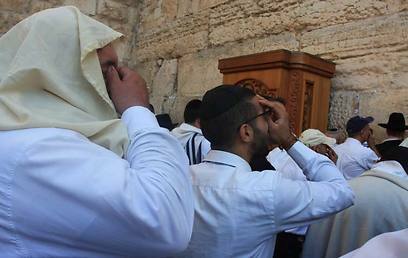 Sharansky told Ynet, "It's true that since 1968 the Western Wall has been divided between prayer and archaeology, but there has been no archaeological activity there for a long time, and my proposal is to look at the entire area as a place for Jewish prayer." 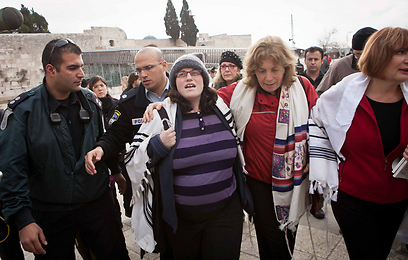 According to the Jewish Agency chairman, "The court has ruled that the place of prayer for the Women of the Wall and others is at Robinson's Arch, but they have said – and rightfully so – that the conditions there are unsuitable, and therefore the arrangement is non-egalitarian. "According to our recommendations, the access will be the same, 24 hours a day, on the same level, with a shared entrance, and no one will be able to say that they are being sent to a second-class place. "I presented it to the government ministers, to the leaders of the Jewish movements in the US, to the Western Wall rabbi, and each of them have their own reservations but they all understand that the situation in which the Western Wall is a place of conflict and dispute must end and that it must be rebuilt as a uniting place. "In this move we are providing a possibility to recreate agreement and a wide common denominator around the Western Wall." Sharansky stressed that his proposal could be implemented even "without touching a single stone of the Mugrabi Bridge," so as not to spark a conflict with the Muslim world. Rabbi Rabinowitz told Ynet, "This re-division of the plaza does not match my worldview, as I believe that there should be one site of prayer according to the place's customs, but we can live with this solution." Sources in the Western Wall Heritage Foundation added that they had worked on the suggested solution for months together with Rabbi Rabinowitz, who is familiar with the proposed alternatives, and that they were therefore convinced that he would support the final recommendations. The Women of the Wall organization said in response that it had yet to receive the recommendations and would comment about them after getting the final report. "We would like to believe that the recommendations submitted to the prime minister in the coming days will present a breakthrough, which will pave the way for women seeking to act on their right to pray at the women's section at the Western Wall to enjoy the same rights given to men, as part of a comprehensive solution, which will meet the needs of pluralistic groups as well," the organization said in a statement. "We further expect that until the implementation of the recommendations, the section in the Protection of Holy Places Law – for which women praying at the Wall are detained on charges of praying out loud, reading the Torah and wearing a prayer shawl – will be canceled immediately and replaced as soon as possible with a solution allowing the Women of the Wall to pray in their own way and faith." Attorney Yizhar Hess, CEO of the Masorti Movement in Israel, said in response: "We are facing a difficult task – taking the Western Wall and returning it to the hands of the entire Jewish people, allowing it to become a symbol and a national site, rather than a synagogue serving just one extreme faction. "The process launched by Sharansky in meeting with the leadership of the non-Orthodox movements in Israel and in the US, and the formed outline, is a welcomed move, but it is just the beginning of reaching a different reality." See all talkbacks "Outline sees mixed public praying at Kotel"